Every wheat importer wants to get the right wheat at the best possible price. The key to success for wheat buyers is in the details of their tender specifications and a transparent system that gives them many options. 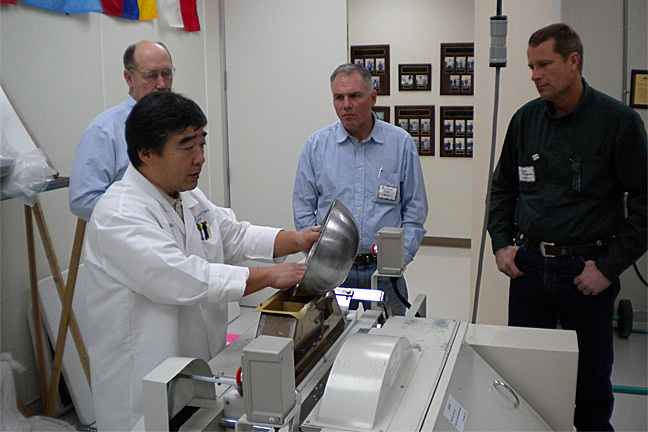 That is what a group of Korean flour milling supply managers learned recently at a USW-sponsored “Contracting for Value” workshop at the Wheat Marketing Center in Portland, OR. In the workshop, the Wheat Marketing Center’s technical director and Asian foods specialist, Dr. Gary Hou, explained how wheat quality is measured and how it relates to end-product quality in baguettes, pan bread, cookies and sponge cakes. Wirsching showed the Korean buyers how to tailor their tenders using the language of U.S. grain exporters and the Federal Grain Inspection Service (FGIS) that independently inspects and supervises wheat loading at the export elevator. An export elevator loads bulk wheat cargo by filling 1,000 MT loading bins to create sublots. Armed with the importer’s specifications, FGIS collects samples from sublots for every load out at every export elevator. If the wheat does not match the buyer’s specifications, FGIS rejects the sublot and returns it to storage. FGIS inspectors record the inspection results of every test on every sublot in an “Export Inspection Log” that the buyer can request, along with official grade and inspection certificates. At the workshop, USW and its partners noted that importers might also request additional statements about their purchase. For example, the buyer may require a sworn statement certifying fumigant application in accordance with U.S. federal and state regulations. A phytosanitary certification by the Animal and Plant Health Inspection Service may be requested. A buyer may also request a certificate of origin from the exporter stating that the wheat was produced in the United States. The U.S. wheat industry takes pride in its products and its position as the world’s most reliable choice. It is very important that both our domestic and export customers can depend on the integrity of our supply chain, the quality of U.S. wheat and our unmatched reliability as a supplier. To learn more, contact your local USW representative.